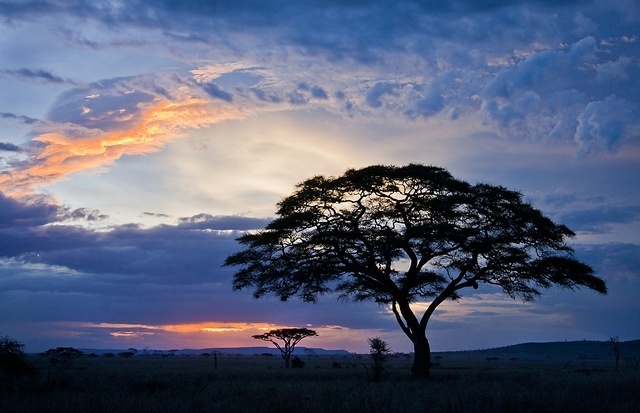 Serengeti National Park is a World Heritage Site and one of the world's seven wonders. It is also Tanzania's oldest and most popular national park. The park is situated over 300 km from Arusha, stretching north to Kenya and bordering Lake Victoria to the west. The park offers spectacular game viewing in Africa. 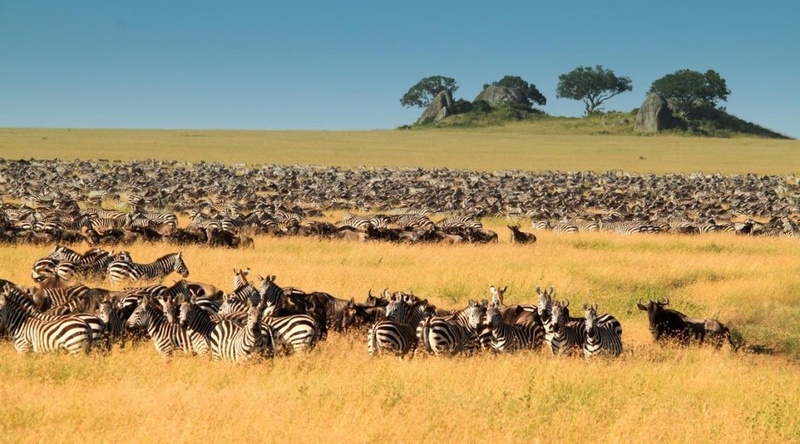 One would literally see tens of thousands of zebra and wildebeest covering the plains as far as you can see. 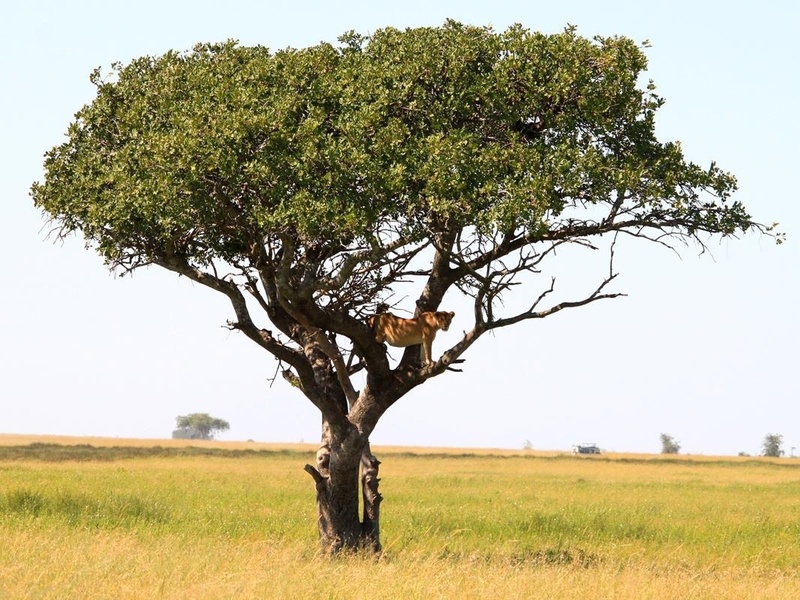 The Serengeti is the iconic African game park for a good reason; no other park compares to it with its vast golden green grasslands interspersed with koppies (small bouldered hills) and other varied terrain. It is simply quite unique and one of nature’s wonders. As expected these estimated three million large animals attract predators like hyena, leopard, cheetah and the king of the beast. All sleek and fat, they abound on these plains during the migration. The Serengeti public campsites are basic, consisting of a water supply, an ablution block, kitchen, eating and washing up area. Maasai rock paintings and musical rocks. Entrance and camping fees have to be paid at the Naabi Hill Gate entrance. You also have to choose the public campsite that you are going to use. You may not camp at another site. Visitors also have to check in and out through this gate, at the office of the Ngorogoro Conservancy. There are many flies. On top of this the western side of the park had a huge number of tsetse flies. You may want to spend a morning in Arusha gathering information and completing the formalities to enter the Ngorongoro Conservation Area. You have to pass through the Ngorongoro area if you wish to enter the Serengeti from the east, and you have to pay separate entry fees in each area per person and per vehicle. It’s possible to pay using a credit card at the entrance gate for the Serengeti, but not so for Ngorongoro, where you have to deposit the required fees into their bank account, which details you get at the Ngorongoro office in Arusha. Then upon presenting the deposit slip at the Ngorongoro office in Karatu, the last village before Ngorongoro, one is issued with a Ngorongoro Card to be presented at the entrance gate. Permits are issued for a 24 hour day from time of entry. The main road inside Serengeti National Park towards Seronera is very bad it was recommended that you plan your trip on the side roads.